Road Rescue Teams provide vehicle extrication, rope rescue and other specialized rescue services in response to motor vehicle accidents. Responders attend to out‐of‐jurisdiction motor vehicle accidents across the province. Road Rescue training may include hazardous material awareness, embankment rescue, fire suppression, and First Responder training in addition to extrication training. 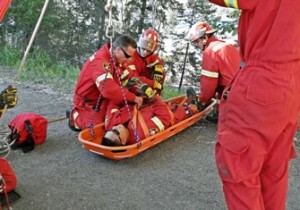 BC Road Rescue organizations include Fire Departments, Road Rescue Societies, and SAR teams. We operate in the Fraser Ft George Regional District. 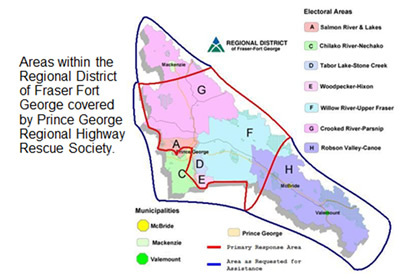 The Regional District of Fraser-Fort George (RDFFG) is a regional district located in the Central Interior of British Columbia. It is bounded by the Alberta border to the east, the Columbia-Shuswap and Thompson-Nicola Regional Districts to the south/southeast, Cariboo Regional District to the southwest, the Regional District of Bulkley-Nechako to the west, and the Peace River Regional District to the north/northeast. As of the 2006 Census, the Regional District had a population of 92,264, and a land area of 51,083.73 km² (19,723.54 sq mi). At our hall we currently have 2 bays. We are only able to hold 2 of our 4 vehicles, so we are in the process of planning for an expansion. 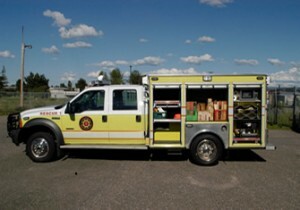 In Bay One you will find Rescue 11, which is our first truck out if we are in a fire protected area. On Rescue 11 we have a few of the bigger, more unique tools for extrication. In Bay Two you will find Rescue 12. This truck is equipped with a Compressed Air Foam system which is used to suppress vehicle fires. We take rescue 12 on all calls that we do not have a fire department backing us up. Also in the hall, we have our board room where before each training night we have a meeting as well as host all of our other meetings. Behind our hall we have a small compound that is used for training. We have 2 different training nights so that we can split up our group for a more hands on training. Every Wednesday and Sunday night we train on a vehicle. We use different specialized techniques to remove the vehicle from the patient. We carry our radios and pagers with us when we are on-call. When our pagers go off, we are connected with the Fire Operations Control center. FOCC then tells us where the call is and what we are dealing with. The members on call then have to make it safely down to the hall in under 10 minutes. This is why our members have to live within 10 minutes of the hall. Once the first person is at the hall they have to get a task number from EMBC. We then get our bunker gear on and get in the truck call FOCC on the radio and let them know we are responding. Our trucks are fully equipped to handle almost any road rescue situation involving regular sized vehicles. We are currently developing a Heavy Rescue Unit to handle industrial vehicles. We train twice per week on Wednesday nights and Sunday nights. In-class training and in-the field training is a part of our weekly routine. We have great partners that we work with. We are very proud to stand beside these exemplary companies.